I'm currently studying PRIMs within the context of ACT-R by reading these two papers. In the papers, there are references to both declarative and working memory modules of ACT-R. What is the difference between these memory modules? Is the only difference the allowed operations on this memory and thus their use? Are there also decay effects in working memory? 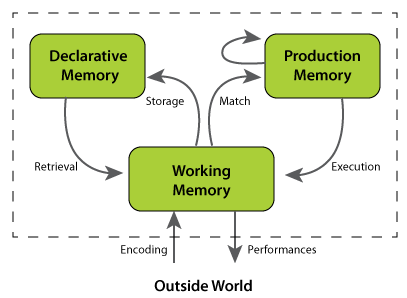 Declarative memory takes the form of a semantic net linking propositions, images, and sequences by associations. The nodes of long-term memory all have some degree of activation and working memory is that part of long-term memory that is most highly activated. The declarative memory is all knowledge that can be retrieved in consciousness. Working memory activates only the declarative memory needed for the current task. When a different task is given, the activation changes to match the needs of the new task. The non-relevant active knowledge is deactivated, and new relevant knowledge is retrieved. Not the answer you're looking for? Browse other questions tagged memory cognitive-modeling working-memory act-r or ask your own question. Is there difference between a memory of a dream and memory of waking experience?